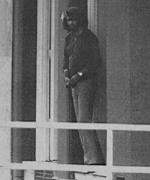 Over a period from November 1971 and March 1972 Gary Foley was secretly photographed by the Australian Security and Intelligence Organisation (ASIO) entering and leaving the Headquarters of the Communist Party of Australia (CPA). 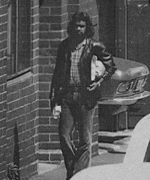 At the time the Aboriginal rights movement generally, and the Black Power movement in particular, were being accused by Australian conservatives of being 'Communist influenced'. This was a popular catch-cry of the Cold-War era and was used against many community activists, artists and others committed to social justice. No doubt ASIO thought they had hit the jackpot when they photographed both Gary Foley and Denis Walker visiting the CPA headquarters in the Haymarket in Sydney. 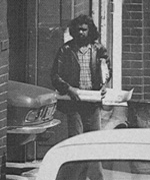 As both Walker and Foley were regarded at the time as two of the key leaders of the radical Black Power movement, ASIO probably considered their CPA visits as confirmation of their conspiracy theories about Black radicalism being a 'Communist front'. 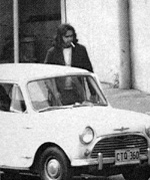 The lunatic paranoid fantasies of ASIO were fueled by photos such as these. Sadly for ASIO the truth was much more Mundane. Gary Foley had asked Noel Hazard, photographer for the Communist newspaper Tribune to teach him how to develop photographs in a darkroom. Hazard had offered to teach Foley using the Tribune darkroom, and so over the period when ASIO took these photos Foley was visiting Hazard and learned darkroom photographic proccessing. 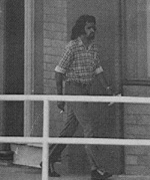 Foley was not even aware at the time that he was being photographed and it was not until these pictures became available thirty years later in 2002 on the National Archives website that he became aware of their existence. 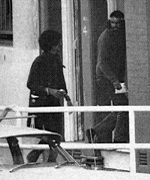 Once aware he realised that these photos were probably the basis for the numerous accusations levelled against him throughout the 1970s and early 1980s of being 'Communist influenced'. For those who always look elsewhere to explain indigenous discontent this should be a salutory lesson that one should never leap to conclusions.